No matter what kind of board you like to ride, what wave you like to surf or what level you’re skills are at, Costa Rica delivers and we can create a surfing vacation to match. Really disconnect with a long visit to one of Costa Rica's most beautiful beaches, Mal Pais, for 8 days of surf, sun, and sand. Learn how to surf or polish your technique on this custom vacation package. Head straight to Tamarindo, stay beachfront, and ride those waves! The Pacific coast of Costa Rica offers some stunning beaches, and you will get to experience them while riding the waves in this custom vacation package. Costa Rica is famous around the world as one of the top destinations for surfing. Year-round warm water and consistent waves make it a draw for people seeking all manner of Costa Rica surf vacations. The variety of coastline offers up a myriad of options for anyone looking to enjoy the thrill of riding waves in Costa Rica. There are both soft beach breaks for beginners and barrelling point breaks for more advanced wave riders. No matter what kind of board you like to ride, what wave you like to surf, or what level your skills are at, Costa Rica delivers. Enjoy a personalized surfing vacation package that matches all these along with your favorite type of hotel. It’s a matter of understanding which locations are better suited for which kind of travelers. The waves of Northern Guanacaste were made famous in the Endless Summer movies. 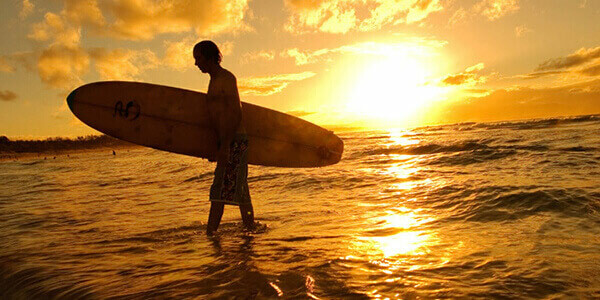 Surfers flock to the beaches of Tamarindo, Playa Grande, and Langosta each year to test their skills in their waters. Take a day boat charter to the secluded Ollie’s Point or Witch’s Rock, protected by the dry forest of a National Park. Enjoy waves and landscapes unique to Costa Rica and create lifetime memories in the water. There is even chance to meet the legend Robert August. He frequently returns to his shop in the town of Tamarindo, which he helped popularize in the 90s. There are a number of beachfront hotels in the area which are just steps away from the waves. We also work with reputable surf instructors who can help you with everything from making the first pop up to guide you to the break of your choice. The North of Guanacaste has Tamarindo and secluded bays, but the other side also has good options for surfers. The Southern part of Nicoya Peninsula is a mecca for surfing and yoga, with towns like Nosara and Mal Pais featuring prominently in travel publications over the years. Many truly beachfront accommodations dot the shoreline and the long, open beaches offer plenty of opportunities to grab a peak alone. The low season is particularly ideal for those travelers who enjoy less crowded but popular locations, as high season brings more visitors than other areas. After all, Nicoya is famous for its natural beauty. The Central Pacific region of Costa Rica provides some of the heaviest waves in the country but also a few surprises. Right at the port of Caldera is the left-hander known as Barranca, which is almost a mile-long. This wave is particularly great for longboards, and its ease of access means it gets crowded at times. The flow from the Barranca River can be a little cold as the water comes from the mountains. Further South find the more famous breaks of Jaco and Hermosa. They are separated only by a few minutes of road, but the waves are hugely different. The horseshoe bay of Jaco provides a much softer and easier wave, good for beginners. It closes out quite fast, so more advanced surfers will find more fun elsewhere. On the other hand, Hermosa is a long, dark-sanded beach which offers a genuine board breaking wave. Fast and with plenty of barrels to catch some shade from the sun, this is one of Costa Rica’s premiere locations for surfers. Traveling South from here, the beaches are less crowded but offer excellent surfing as well. Esterillos, Bejuco, Dominical, and onward provide high-quality surfing off the beaten path for visitors who want lesser known destinations. The very South of the country is home to two of the best waves available, Pavones and Matapalo. Facing each other on opposite sides of Dulce Gulf, both are secluded spots and closer to nature. They are also a little more fickle than other beaches but will reward the adventurous traveler. Knowing the most popular surf towns and having deep local knowledge of where the best waves are is key to a successful surf trip. Some surfing spots are less crowded than others, or closer to other adventure or nature activities in case you want to change the pace. If the whole family wants to hit the beach and try the surf, that’s possible too. With that level of understanding it’s easier to make a travel itinerary that adjusts to your personality and needs. Costa Rica Vacations can take the hassle away, leaving space only for fun and sunny days. To make your surf package unique and full of the best waves, contact us today and let us help you plan the ultimate surfing vacation package to Costa Rica. If you have never visited Costa Rica before, find a good local guide to surf with. You don’t want to end up surfing a few hundred yards from the best break on that beach, just because you didn’t know about it.